Sally Manikian taking a break during an all-night mush. While visiting Shelburne recently, NHPR’s Sean Hurley heard about Sally Manikian. 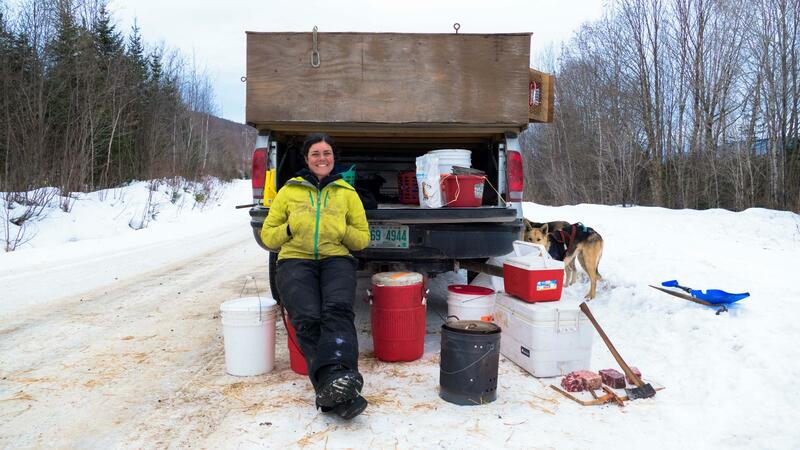 She's a local dog musher - yes, that's unusual, but for reasons more than that, reasons he couldn’t quite discover, she'd caught the town’s attention. What, he wondered, made Sally Manikian so … well, interesting to her neighbors? He went to find out. Though Manikian’s training runs usually manage to go unobserved, Sally herself, living in Shelburne, has not. After a fifty mile run, Sally lays out hay and wraps her dogs in warming vests. When I finally met up with the famous Sally during a break on one of her long training runs, I ask her why she’s so well known in town. 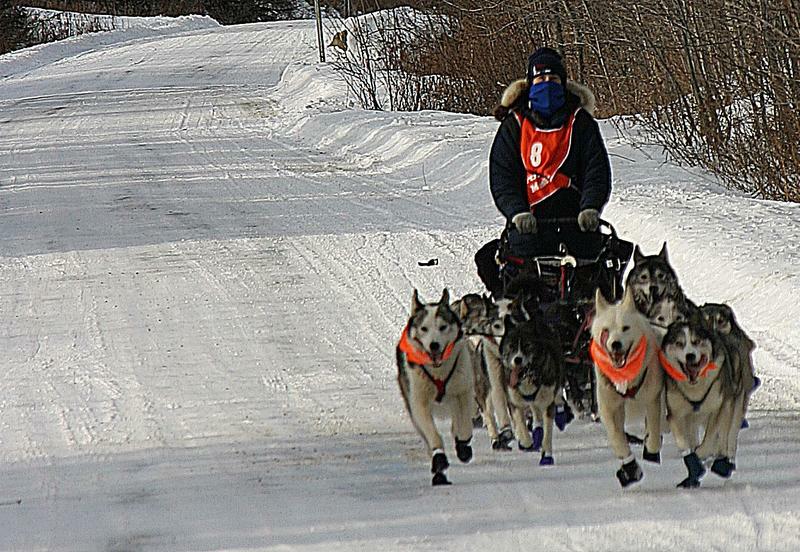 It’s not her dog sledding, she says – she’s never won a race and there are other mushers in town. 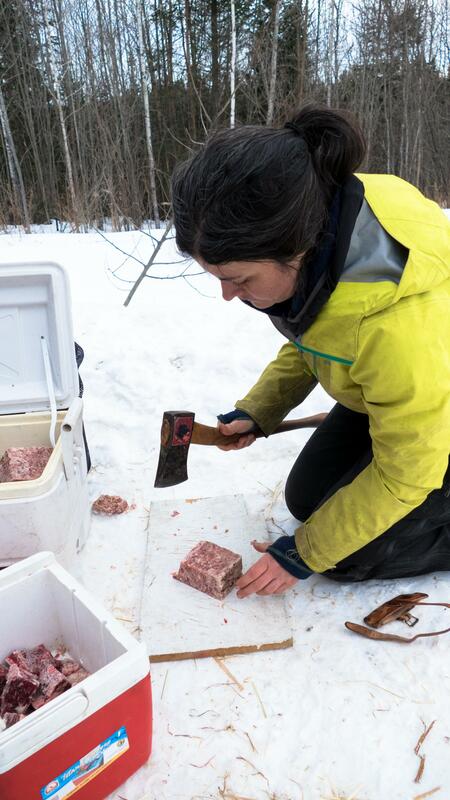 After wrapping the dogs in warming vests, she hauls out a 5-gallon bucket loaded with red frozen bricks of meat that she begins to chop into smaller portions with an axe. “So this is beef and chicken. And this will be the snacks for the trail,” Sally explains. The axe made dog snacks. This – the dogs, axing bricks of meat, mushing through the night - is not exactly the life she expected, she tells me. When she was a little girl she had a pet rat. The family had cats. She has 22 dogs now. As a little girl, a lot of her time was spent indoors. “Like we weren't an outdoors family. We were not a hiking family,” she says. But even as she began to care for her siblings, Manikian also knew she’d have to find some way to take care of herself. “We bought a house for my brother and sister and I to live in - and we moved in August and in September I had my first five dogs,” she tells me. A shot from Sally's 2017 UP 200 race. When I ask if there’s a connection, Sally says, “Oh absolutely! I also knew when I moved in with my brother and sister that I needed something that was uniquely mine. And at that point I was really, really depressed - like I had helped my mother die in a six-month period, I had packed up my family home, relocated my brother and sister north,” she says, and sighs. She works full time for a national conservation organization. Her brother and sister have part-time jobs, cleaning six hours a week at local shops. When she travels for races, a caregiver is always at the house to watch them. Getting ready for the night run. Sally is often a topic of conversation when Shelburnites get together. You are the talk of the town, Ken Simonoko tells her at one such gathering. 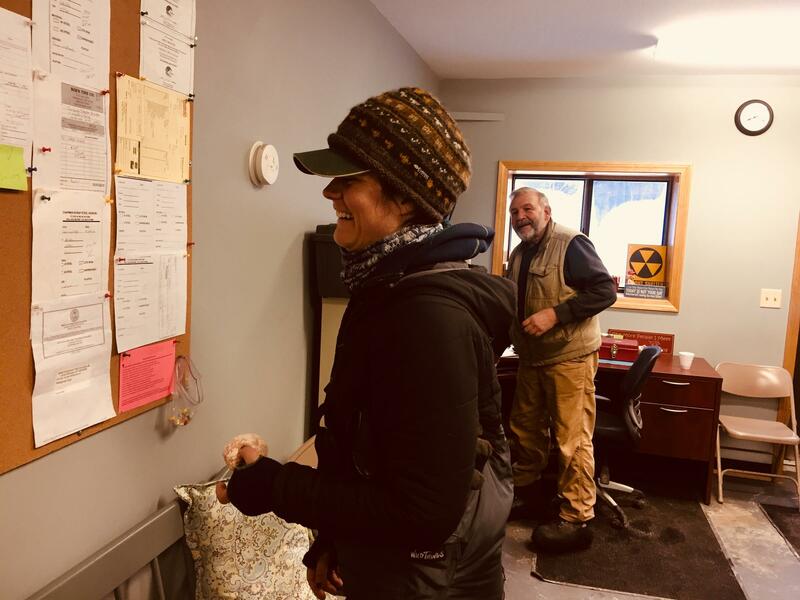 Sally and Ken Simonoko at the Shelburne Transfer Station. “You are. Of course,” John Gralenski agrees. There’s a certain kind of person who becomes famous locally in a way that also means they will never be known to the wider world. Not famous for any great achievement or particular skill. Who they are is enough. Which is why Paul Patry, who sees other dog mushers from time to time, only stops to watch when Sally passes on the sled. Waving, gliding away into the wilderness. Run, rest, run-rest-run. It’s roughly 10 degrees on Saturday morning at the Mahoosuc Inn in Milan and about 200 sled dogs are yowling and barking, making it clear it is time to race. There are 17 teams entered in the Mahoosuc 100 and each has 12 incredibly impatient, excited dogs. The mushers move among them. There are hugs and licks. 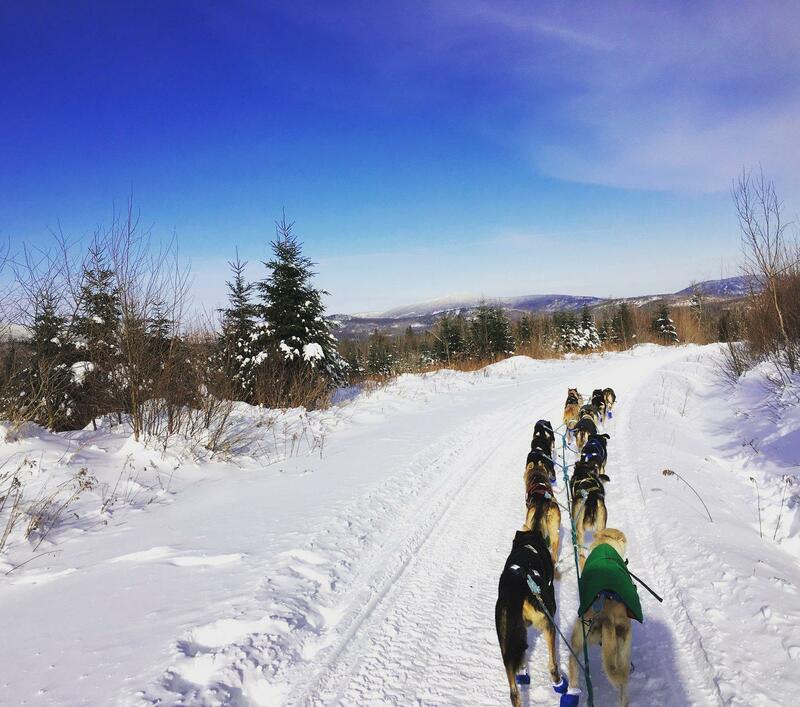 The dogs throw themselves against their harnesses and are so eager to go that an ATV is hooked to the back of each sled to hold the dogs back as they approach the starting line. 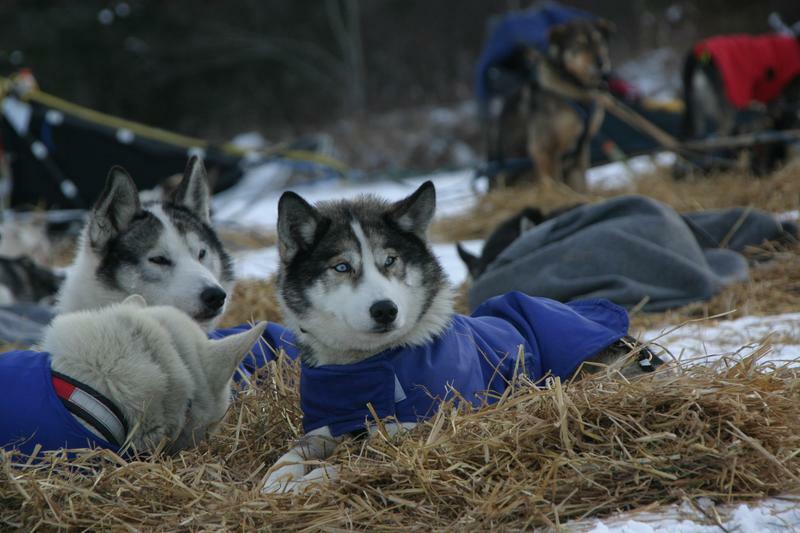 A three-day sled dog race scheduled to start Thursday has been cancelled due to a lack of snow in the North Country. 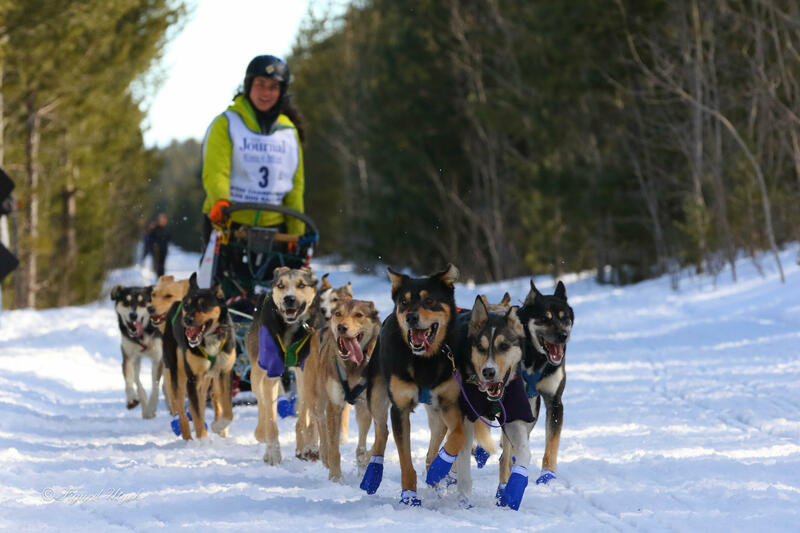 “Honestly I’ve never seen a winter this bad since I moved up here and started running sled dogs," said Jaye Foucher, one of the organizers of The Great North Woods Sled Dog Challenge who has lived in the North Country for 13 years. "I had hoped that the winter would turn around," she said. The event was scheduled to start in Bretton Woods and then move to Colebrook, Pittsburg and Milan.